I started looking for this color after seeing it on lots of blogs, and it took me forever to finally come across it. I snatched it up when I found it in an out-of-the-way Walgreens! Okay, I think this is the last food polish I have to share. It’s Just Add Milk by Whimsical Ideas by Pam. This is the polish that made me try out this brand; it looks just like chocolate chip cookies! For the next installment of my food polish posts, here’s another Lynnderella – Spumoni! This makes me think of ice cream. Lynnderella’s Salad Days is another food polish that I couldn’t resist. I’m a vegetarian, so when I came across Salad Days, the name kind of got me. I’ve noticed that I have a thing for food-related nail polish. One example follows: Candeo Colors Smores polish, which I just picked up recently. When I was checking out the new Estee Lauder spring collection I was drawn to the coral color (Coral Cult), but I thought it seemed too close to an old Sally Hansen to justify buying. So I pulled out Sally Hansen’s Coral Fever to check. Over the last few days the weather here was dark and gloomy, so I’ve been wearing a wintery Essie combination of Cocktail Bling and A Cut Above. The OPI Mariah Carey Collection also included four polishes in a “Liquid Sand” finish, so I picked one to try – swatches of Stay The Night coming up! These are just a couple of pictures of my Christmas nails from this year – I decided to use China Glaze’s Mistletoe Kisses alone, with no extras. My favorite holiday polish ever is Party Hearty from China Glaze – it’s the perfect mix of big red glitter and smaller green and gold glitter. It came out in 2010, so it’s fun to pull it out each year, sort of a holiday tradition. 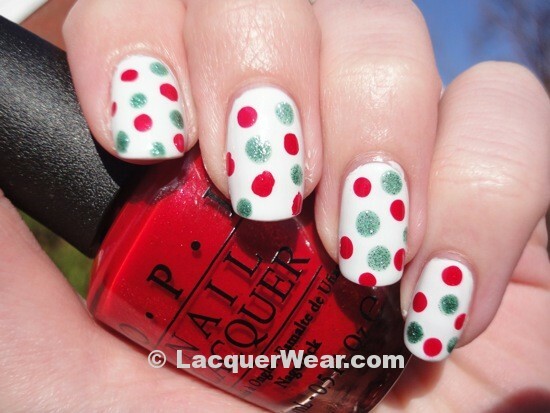 I saw a polka dot manicure on Short n’ Chic recently that I liked a lot, so I tried it out myself. It required buying a bottle of OPI’s My Boyfriend Scales Walls to use as the base, but I had been considering that anyway so it provided a good excuse. 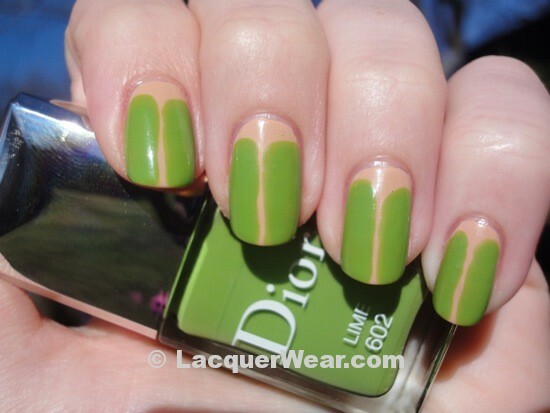 I tried out a new combination with Dior Lime – I used a base of Sally Hansen Malt for a “y-gap” manicure, a design used by U.K. nail celebrity Sophy Robson. I’ve been trying to branch out lately and try the sorts of nail art things that I haven’t done before, so I have here my first moon manicure, using OPI’s Tomorrow Never Dies and Dior’s Grege.